We don’t sell lighting though we will prepare your shelves either for puck lights or LED strips. Holes for pucks are $20 per hole. Most pucks will fit a 2-1/4” hole, some require a different size, please be sure to specify the correct size holes we need to drill. We also offer a routed channel with a diffuser lens that we will flush mount into your shelves, $35 each shelf. Our channel will fit many of the strips available today, the inside dimension is 11/16” wide x 5/16” deep. The ends of the channel locate 1″ in from the ends of the shelf. The minimum distance from the front or back edge is 1”. Please make a sketch with all dimensions showing where to place the channel. 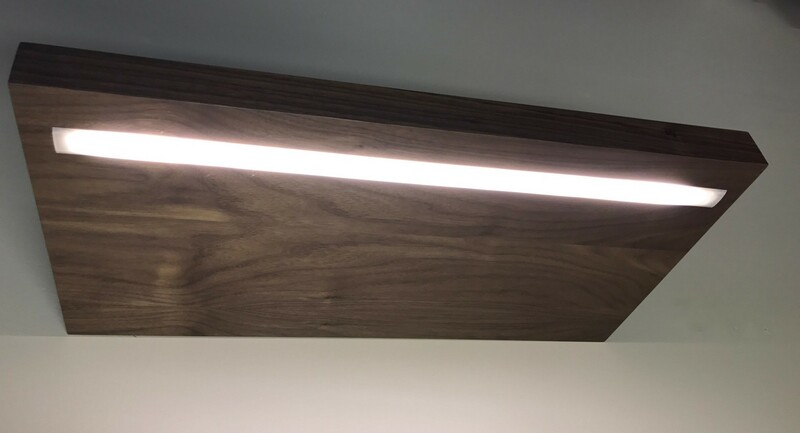 1) The wiring to connect this sort of lighting is typically for use inside kitchen cabinetry and the like, and isn’t building code-acceptable for installation in a wall cavity unless encased in solid conduit. 2) Just about all LED strips must be plugged into a transformer or driver, so you’ll need to find a serviceable location for the driver. We can install the channel or drill for pucks in any type of our wood shelves. We cannot cut a channel in stainless steel shelves however we can make holes for pucks in stainless.